Measured along the diagonal from the top left hand corner to the toe, the stocking measurements are either 20" on red and gray Reindeer designs and 22" on red green Reindeer designs, and the width along the cuff is about 7.5" inches. Lining: These Christmas stocking are not lined inside. Materials: It is constructed of soft grey , red , green matching felts, complemented by knits and plaid tartan and you can load it up with lots of stocking stuffers. Base is soft with exterior covered with chenille knits, fleece patches and the snowflake decorations on the stocking body are white plastic sparkled with shimmering glitter. The red and grey stockings have faux fur cuff. 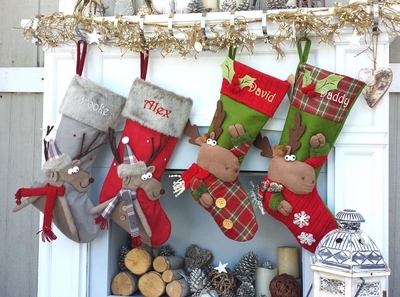 Names can be personalized on the cuff of this Christmas stocking with embroidery thread. White thread is the most popular on this stocking and silver or gold looks good as well.